Cooking wild mushrooms and fresh trout together seems like the most natural thing in the world. The pairing of fish and fungi, with their mild flavors and moist, tender textures make the pairing nearly inevitable. Perhaps it’s some half-forgotten memory from our hunter-gatherer past; fat trout, snatched from a cold, fast-running stream, cooked together with mushrooms found nearby on the moist riverbank, must have seemed like a magical union of earth and water. Add a third element, fire, and you’ve got dinner! Matsutake mushrooms, as they’re known in Japan, are one of our favorite fall mushrooms, and they go particularly well with fresh fish and seafood. The name itself literally means “pine mushroom,” (matsu = pine + take = mushroom). Indeed, their common name in much of North America is just that – the pine mushroom. The name is completely logical, since they are most often found in direct association with certain pine trees of a particular age. Their flavor is strikingly pine-like, aromatic and woodsy, with notes of cinnamon and earth. 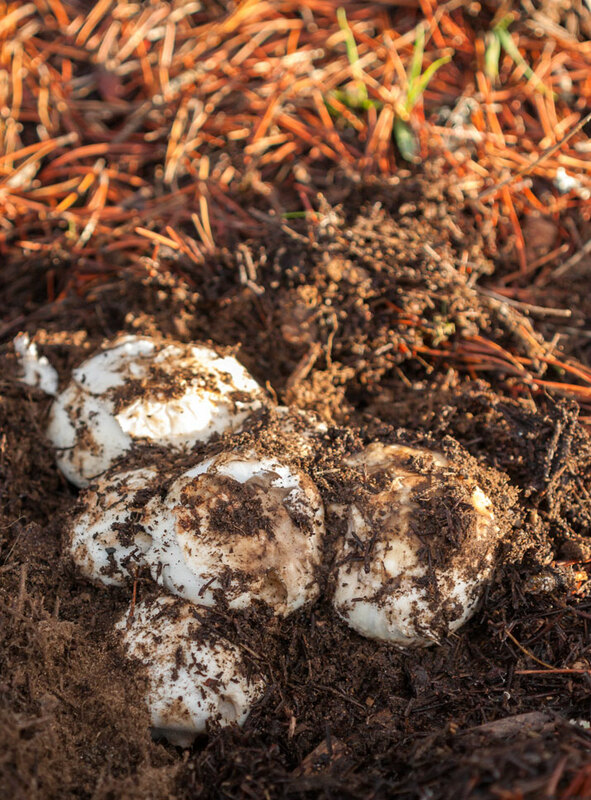 While matsutake mushrooms superficially look much like a common white button mushroom, their texture is very different. Fresh matsutake are very firm and keep their shape even when sliced or chopped. Their texture holds up well, even after cooking, giving a pleasing resistance to the tooth, whether they’re simmered, roasted or grilled. You may notice that many matsutake mushroom recipes have a distinct Asian flair; not surprising, since they are highly revered among many Asian cultures, most notably in Japan. Our recipe uses several classic Japanese ingredients in the marinade; soy sauce, mirin (a sweet cooking wine) and the classic rice wine, sake. The trout, however, is seasoned simply with salt, pepper and rosemary, an herb long used in the culinary tradition of the Western world. This simple combination works surprisingly well with matsutake mushrooms. The aromatic, resinous scent of the fresh rosemary is quite similar to that of the mushrooms, highlighting the pleasantly piney flavor and aroma wonderfully. First, prepare the matsutake mushrooms. Brush any dirt and debris from the mushrooms with a brush or paper towel. If the stems (especially the base) are very dirty, carefully use a vegetable peeler to remove the offending areas. Slice the mushrooms into 1/4 inch thick slices and place them into a shallow dish. Add the soy sauce, mirin and sake, swirling to mix. Allow the mushrooms to remain in the marinade for 15 minutes or so, turning from time to time. Preheat the grill, either traditional charcoal or gas. Once the grill is good and hot, oil the grate to prevent sticking. Remove the matsutake slices from the marinade and quickly place them around the grill. After about 2 minutes, turn them and cook for another minute or two. Remove from the grill and set aside. Rinse the trout with cold water and pat dry with paper towels. Rub the inside generously with sea salt and pepper. 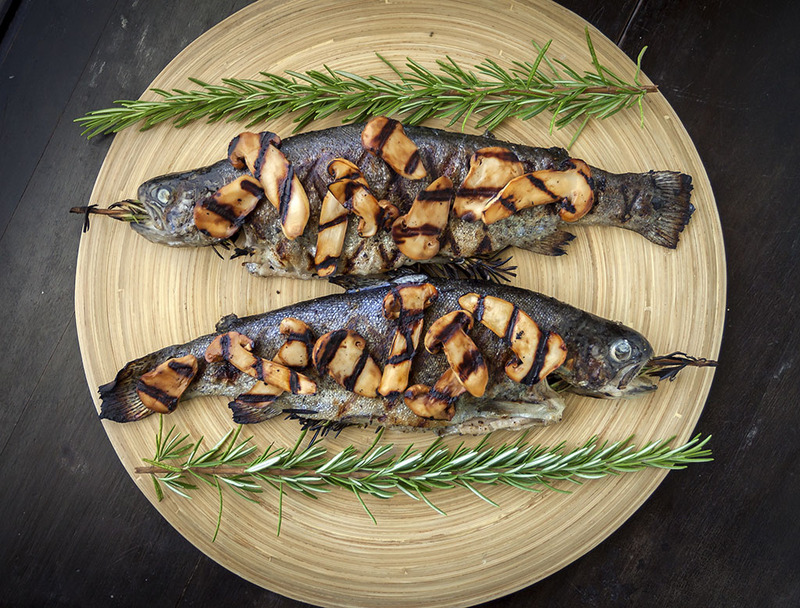 Insert a rosemary skewer into the fish’s body cavity, poking the bottom end out through the mouth to secure it. Brush both sides of each fish with olive oil and set aside. Place the fish on the grill and close the cover. 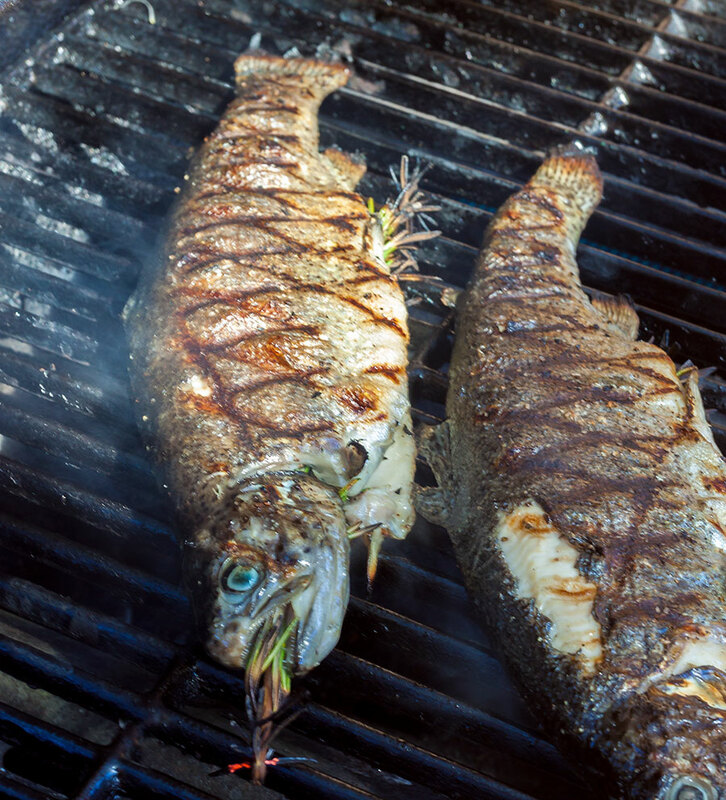 After 3 or 4 minutes, remove the top and carefully rotate the fish 90 degrees to give it attractive grill marks. Close the lid again and cook for another 2 – 3 minutes. Open the lid again and carefully roll each fish over onto its opposite side, using a spatula (or two) if necessary. Cover again and cook for another 2 – 3 minutes. Check for doneness and remove from the grill. Remember that fish cooks very quickly and will continue to cook for a minute or two after it’s been removed from the heat. 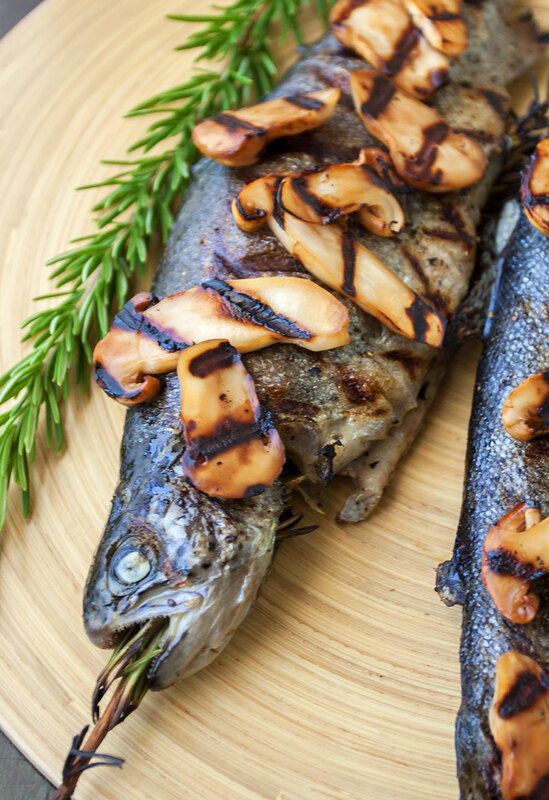 Place the trout on serving plates and top each with half of the grilled mushrooms. Serve with fresh lemon wedges and soy sauce on the side. Garnish with additional fresh rosemary, if desired.